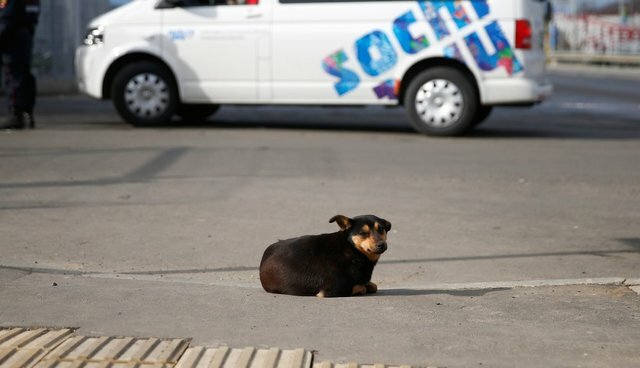 Sochi's stray dogs have been getting lots of attention at the Olympic Games, from athletes to tourists and even to activists that have been smuggling them out of the city. Despite international backlash against the city's controversial culling program, the future of Sochi's dogs remains murky -- though lots of people are fighting for them. We spoke to Andrew Rowan, President and CEO of Humane Society International, about the dogs in Sochi -- and learned that Sochi's stray dog problems are definitely not unique to Olympic cities -- or to cities at all. How many dogs are in Sochi right now? We haven't gotten a good count yet. We've heard reports of 4,000 in total, and 190 at one shelter -- but we don't have any real idea of the numbers. But when when we look at street dogs around the world there are about one to 20 stray dogs per 100 people in other parts of world like this. Compare that to 24 pet dogs to 100 people in the U.S.
How are rescue efforts going so far? We haven't been able to really get the dogs out yet and adopted, because we don't have any people on the ground there. But we are working with organizations on the ground to do that. We've heard reports of people moving dogs out of Sochi, but no confirmation of that yet. We can't confirm that they are getting out or getting adopted. Why are the strays there in the first place? Well it's really impossible to say. One of the causes given in the media is that construction workers have been coming into the city, and temporarily expanded the city's population. Stray dogs are closely associated with humans -- that's why we estimate their populations based on their ratio to humans. Construction workers could have led to an increase in the dog population -- more food means more puppies. That may be one explanation for why there are so many dogs there. Where has this type of stray dog problem been seen before? During a Ukraine football competition, there was a program to catch and kill street dogs. But we stepped in a got one of our celebrity activists to publicize it and put it on her Facebook page, and there were lots of protests. In the end they killed some of the dogs but it was much less intensive than they had planned. In Athens [at the 2004 Summer Olympics] they were very concerned about plans to build huge shelters, because there was a strong cultural aversion to killing the dogs. In the end some of the animals were captured and put in shelters -- but sometimes those can be just as bad, if the shelter is not a good one. What can cities do instead? What you can do instead of killing them is sterilize the dogs. In India, where euthanasia is illegal, there was a huge program for this, and it reduced the stray dog population by 40 percent in three years. So it's possible to reduce the numbers. At the Commonwealth Games in Delhi [in 2010], there was a big sterilization project too, rather than rounding up dogs, because euthanasia is illegal there. But there were still problems -- they didn't do it as well as they could've done. There were other problems too -- in Seoul, Korea [for the 1988 Summer Olympics], dog meat was a problem. In Beijing, they restricted dog ownership in the city to reduce the number of dogs. And I don't know what will happen next in Rio, or for the World Cup there. It's an ongoing and continuing problem. Why do cities with big sporting events cull their stray dogs? Whenever there is some big event, people want to clean up the city. It's like when a guest comes over, you want to clean up the house. Well, lots of guests are coming in for big event, want to clean up the streets. For some reason, people believe that street dogs create a sense of disorder, so they want to trap and kill them. But this is a very short-term solution. What will happen to the dogs after the Games end?